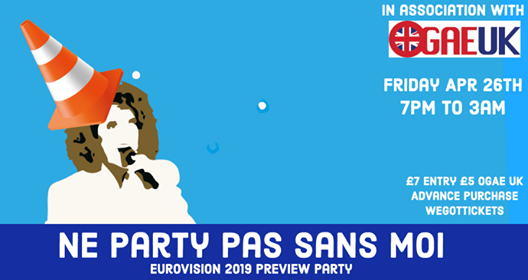 After we had so much fun at our inaugral event in January, Ne Party Pas Sans Moi returns on April 26th, in a new venue in the centre of Glasgow. We’re getting Scotland warmed up for Eurovision 2019 by previewing and voting on the 41 songs competing in this year’s contest. Then we’ll be hitting the dancefloor for non-stop Eurovision bangers. Make sure you stay hydrated. We are now open even later until 3am! The event is run in conjunction with OGAE UK, and OGAE members get a special discount! Tickets which are priced at £5 for OGAE members, can be purchased at https://www.wegottickets.com/event/464660. For more information, you can visit the Ne Party Pas Facebook page at : https://www.facebook.com/nepartypas or the website at www.ne-party-pas.com.